Yesterday was another errand, so we tried to pick up lunch from one of the places on mom's list...only thing was that they weren't open yet...so..."plan B", another choice off of mom's list...Hank's Haute Dogs. I've eaten here in the past and loved it. 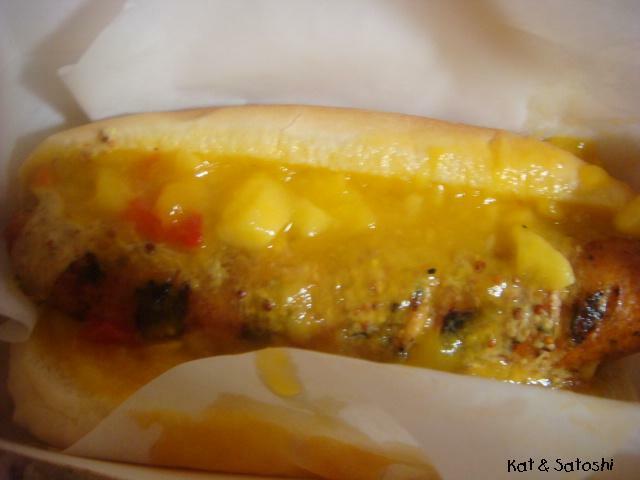 Mom ordered the Chicken...a grilled chicken sausage topped with lime mustard and mango relish. She gave me a bite of this and it was tasty. For my Dad, who likes things simple...we ordered him the Polish. 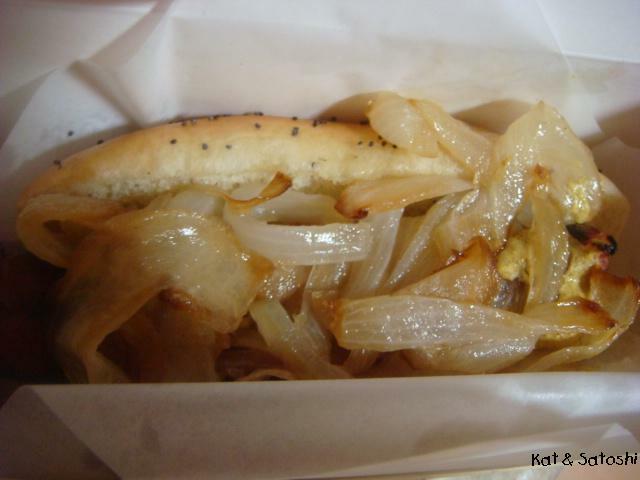 A grilled polish sausage topped with grilled onions and grainy mustard. He liked it though the sausage was a bit koge (burnt). And I ordered the Chicago...after seeing endless posts by Kirk on this, I had to try one. Those tiny sport peppers sure have some heat! 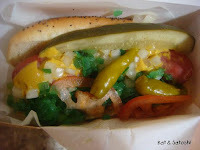 and I liked the neon green relish and other goodies on top too. Mom was happy that she got to try this place and I'm glad I got to try a Chicago dog. 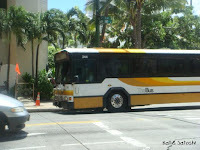 Went out with my friend, Wen yesterday and we had lunch at Giovanni Pastrami in Waikiki. I think this is a sports bar, but there were many booths to sit at, so there were also many families. 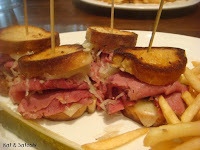 Wen ordered the hot pastrami sandwich and I ordered the reuben bites which were filled with pastrami. Delicious, and definitely no skimping on the pastrami. This went nicely with their crispy fries. Afterwards we went to Starbucks to sit and chat. 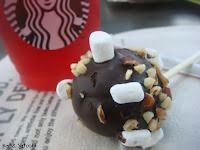 I bought two rocky road cake pops and gave one to Wen. 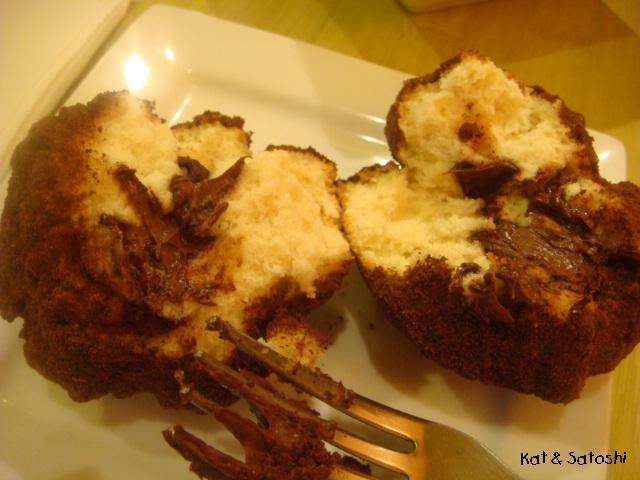 It was like a moist brownie filled with teeny marshmallows and almonds but not too sweet. It's been almost a year since I've seen D, our family friend. I first wrote about him here and then again last year here. Since he knew I was in town, he asked if I would like to go check out a relatively new place called "Home Bar & Grill". Our other family friend, Neil is cooking the food there, which I've written about here. In that time, he had moved to this new establishment. We got together with some of D's friends and it was 9 of us drinking shots and eating all sorts of food like tater tot nachos, kalbi with fried noodles, toro sashimi...just search for this place and you can see all sorts of photos of the food there, different but very delicious! I'm actually a wimp when it comes to shots, so mine were sipped (ahem! )...anyway it was a fun time. As we wrapped up the evening, we planned to get together with D's friend, B, during the week for dinner. Well, on Tuesday, we met B at Off the Wall in the Pearl Kai Shopping Center. I'd never been here, but my parents had and they had even ordered their Thanksgiving turkey from them one year. 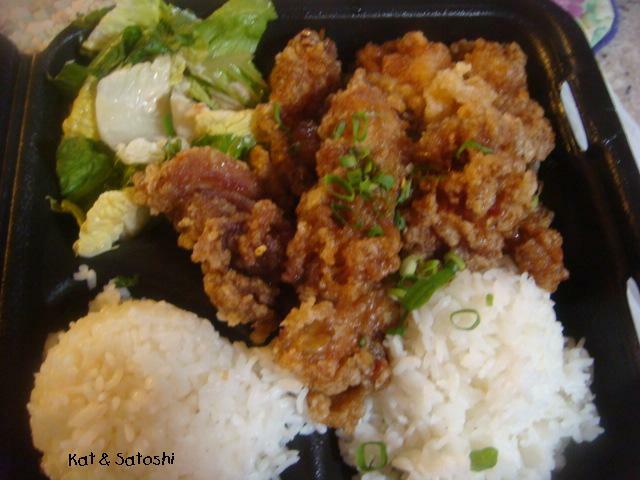 The food is Okinawa meets Hawaii local-style food. We tried Shoyu Pork "pasta" I put pasta in quotes because they actually use the Okinawan soba instead of Italian pasta. We also ordered some edamame hummus, a "naked" spicy ahi poke musubi (a layer of rice topped with some spicy ahi poke), fukuoka style tonkatsu (choy sum wrapped with bacon then wrapped with thinly sliced pork, breaded then deep fried) and some goya champuru. I also tried an apple saketini (like a martini but made with sake)...super fruity. They let us try something that wasn't on the menu (I think), an okonomiyaki gyoza...a fried gyoza topped with some okonomiyaki sauce...so delicious! One interesting thing on their menu was the chocolate filled andagi...so chocolatey and not too sweet. Another item they let us try that wasn't on the menu, a deconstructed banana foster. 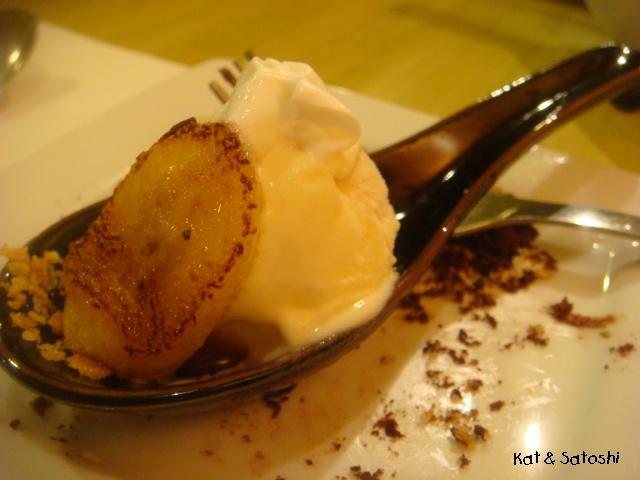 Banana and salted caramel gelato, a caramelized banana and some salty crunch like things on the bottom...good but a little too sweet. Lots of food, lots of chatter and good fun! Thanks B & D! 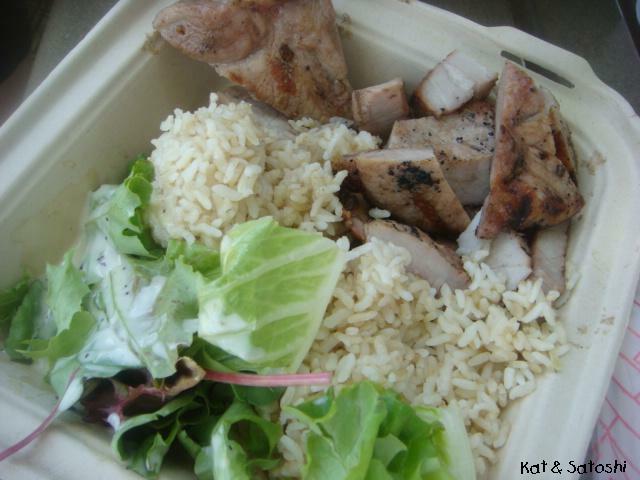 Another errand means another chance to try a new place for lunch...we recently tried Kahai Street Kitchen. 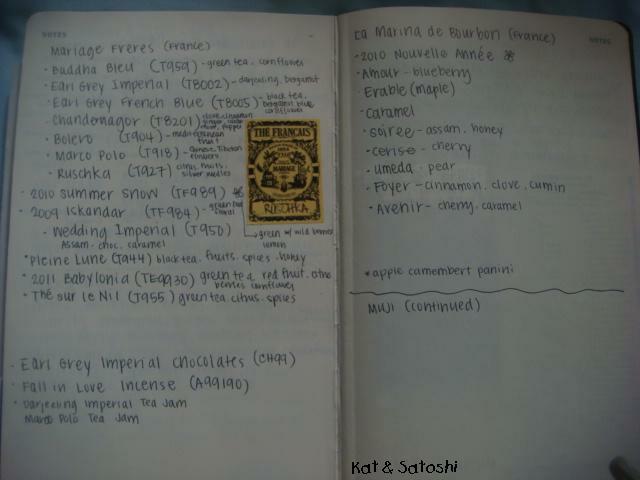 You should know that my mom has this list of places she wants to try, my dad is not a foodie, so he isn't interested in eating out, so every time I come home, we try to knock off as many places from her list as possible. This shop is located in a busy industrial area and the bad part is that they have no parking. 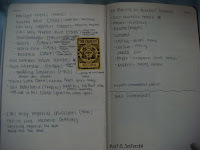 So, while my mom jumped out to order, I circled many many times. 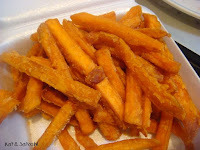 We got a side order of sweet potato fries...a little limp by the time we got home, but very flavorful. The boneless short ribs were very tasty, though some pieces had lots of gristle. Cooked to medium rare, this was quite tender. The meat was marinated in a teriyaki sauce. The garlic chicken was very moist and tasty. The sauce was shoyu based, not a lot of garlic flavor, but it was still very flavorful. All in all nice sized portions for the three of us and delicious...we also appreciated only 1 scoop of rice per plate (usually when there are 2 scoops, like most plate lunches serve, we end up having leftover rice). I've written about my favorite malasadas before here and here...pillows of flaky dough, fried up light and covered with sugar...nom! 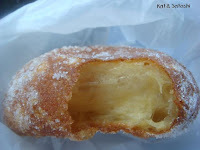 Recently I had one and think that all coffee shops should sell these malasadas with their coffee. I noticed that Champion sells coffee with their malasadas and other treats but also noticed that they have their pot of coffee just sitting out. And while US$1.05 is cheap for coffee, for a coffee snob like me to have it sitting out like that is a big no-no. What would you have with your cup of coffee? 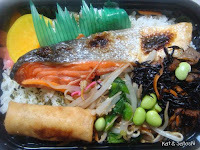 Some random things I'm liking and disliking...starting with disliking...while this bento from Marukai looks really good, most of the side dishes were bland, very disappointing. 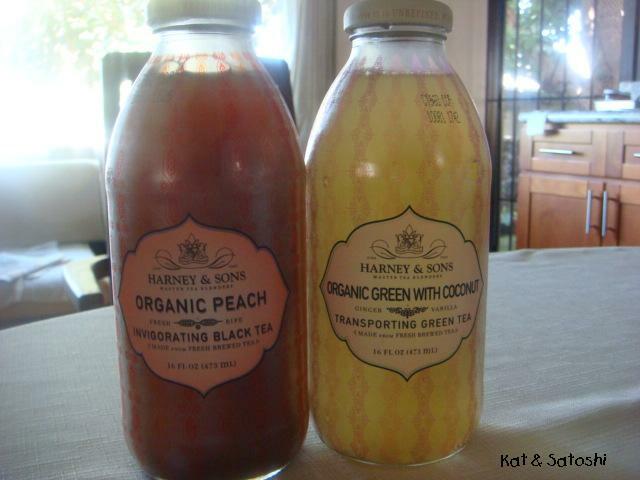 These Harney & Sons bottled teas were also a disappointment, very watery, not much flavor and I didn't add ice when I drank them either. 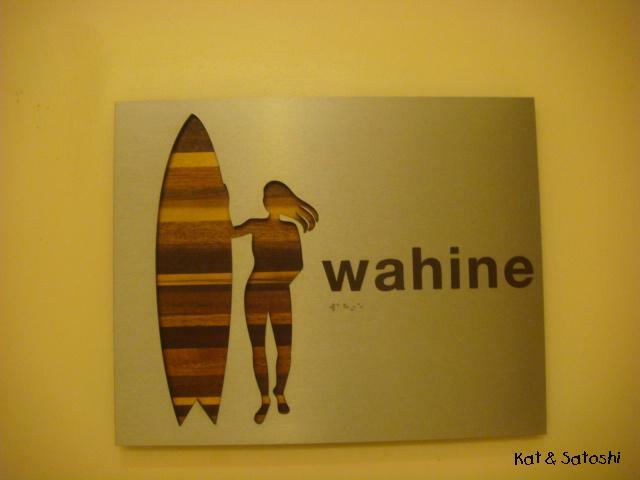 Loving the signs on the bathrooms at the shopping area on Lewers in Waikiki. Wahine (wah-hee-nay) means woman in Hawaiian, you should also know that Kane (kah-nay) means male. Love the garlic cheese balls at Big Kahuna Pizza...my friend Wen and I shared an order and a garlic tomato spinach personal sized pizza for lunch one day...so good and cheesy! Diamond Head Market & Grill's Mochiko chicken musubi is good with chicken in every bite but I think US$3.50 is a little steep for it. I usually choose toppings like peanut butter cup and my all time favorite the hot pink frosted animal cracker. 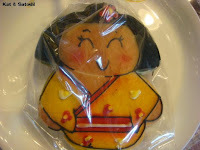 A cute cookie made by Liliha Bakery. My mom received this from a friend and shared it with everyone at a Sunday dinner...while it was cute, the cookie didn't have that much flavor. Apparently the thing to do is paint your nails with a nail polish with "shatter" or "crackle" in the name...I bought my first bottle and love it...you paint a base color, something you want to peek through the "shatter" paint and let it dry thoroughly. 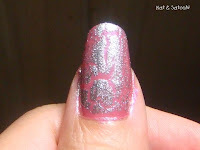 Then add one coat of the shatter paint (mine is silver), if you add any more coats, you will ruin the effect. Wait for this to dry then paint over with a clear top coat...the shatter paint dries to look like it is cracked...fun, yeah?! 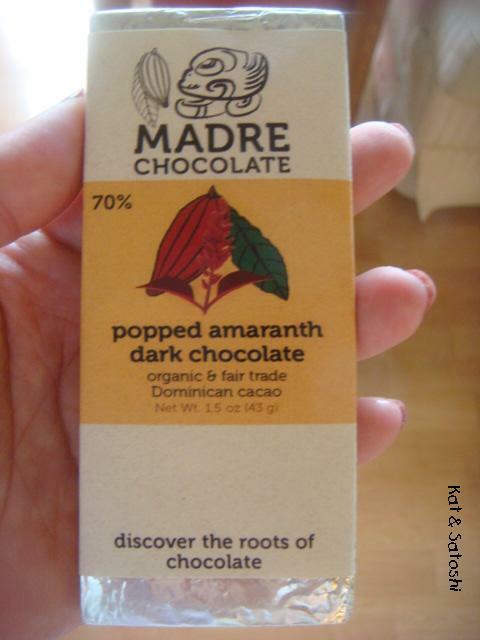 Madre chocolate is a bean to bar operation in Hawaii. 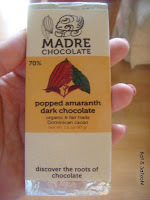 I got this 70% Fair Trade Dominican cacao bar with popped amaranth from Deb and it is delicious. 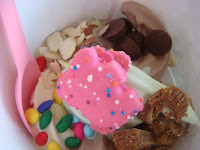 I especially enjoyed the popped amaranth, which seemed like crispies except smokier. Whew! long list...what are you liking? disliking? So all eats are not created equal...whenever you get a good one, there has to a bad one too, right? So, let me tell you about a bad one...now, I usually don't blog about bad places because "if I don't have something nice to say about something..." well, you know how the saying goes. You may have already eaten here, and liked it, but I need to tell you about this place though, because my experience was really bad. After an errand in the area, my mom, dad and I stopped to pick up some lunch at Matsumoto's Okazuya. There were lots of choices, so we picked up some of this and some of that, paid and left. My Grandma and Aunty Marian came over for lunch and we all shared. 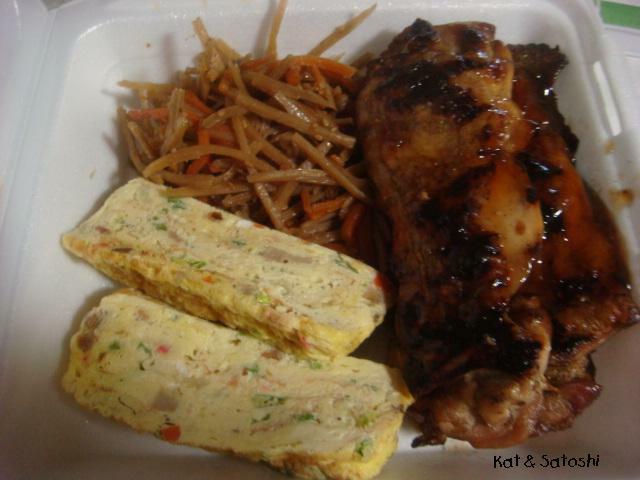 Teri-chicken, tamagoyaki, kinpira gobo, inarizushi, chow funn & corned beef hash patties...US$18.22 tax included. While all this food sounded good, it wasn't. The corned beef hash patties were hard & burnt. 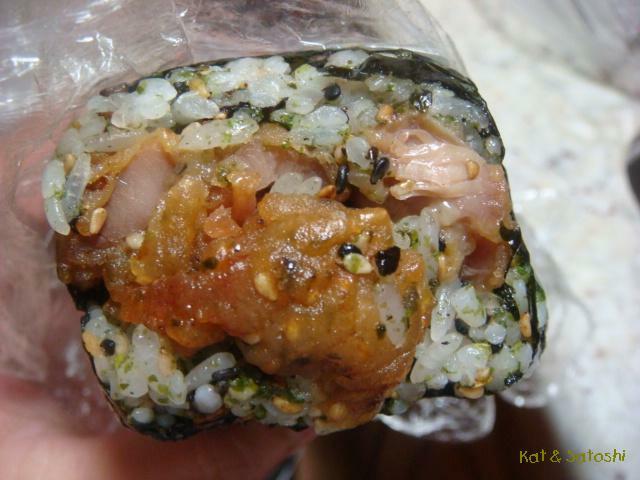 Inarizushi was just rice, usually you have at least some flecks of carrot, there was also an unusual citrusy flavor to it. The kinpira was made from a frozen gobo mix, so it was very very mushy. I could go on and on. I will say that the only thing good was the tamagoyaki, very flavorful and light. 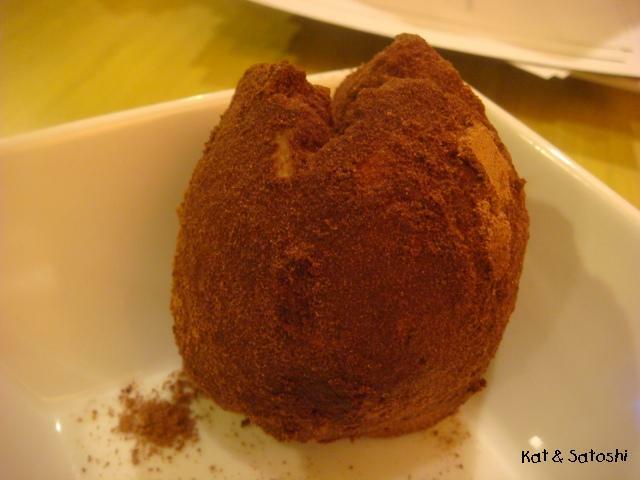 In Japan, they often say that when you partake of a meal, you can feel what the person who cooked the meal was feeling, thinking...for me though, I just couldn't feel the "love" from the person who cooked this. I'm glad we tried this place and I'm also glad that for the most part, my eats have been good experiences, but we won't be coming back here. 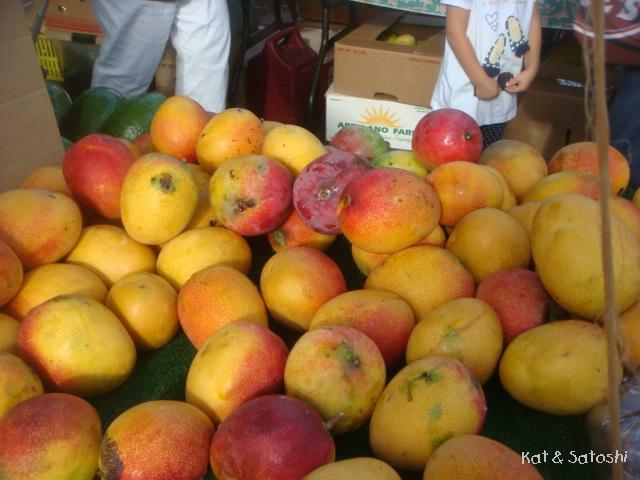 Summertime is usually mango season in Hawaii, but this year, the crops are kinda late. Too much rain and not enough sun are the cause...so instead of receiving mangoes from neighbors and friends, we had to buy...eep! 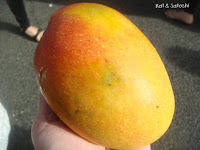 US$4.40 for this mama of a Haden mango...it was sweet and delicious! After we purchased this one, a friend gave us some from their tree and we also got some Pirie mango from my Aunty. Even though we had to buy that first mango, I'm happy we've been able to receive more...Hope I get to eat a little more mango before I go back to Japan. Food trucks have always been a part of Hawaii's culture serving up plate lunches to construction workers and businesses. In recent years though, they have been making a comeback as gourmet food trucks. Ooh and there are dessert trucks too now. I met up with Deb of Kahakai Kitchen for lunch and we checked out a food truck called Ono to Go. Ono (oh-no) in Hawaiian means delicious, so the name of the truck literally means "delicious to go". Unlike some trucks who drive around for a space to sell on the street, this truck is located in a specific parking lot. 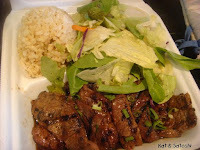 We tried the grilled pork chops with brown rice and tossed salad. The tossed salad was dressed with papaya seed dressing. The pork chops were smoky and quite moist....US$9 tax included. 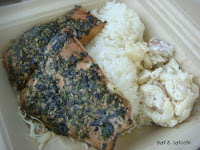 We also tried their teri citrus furikake salmon with white rice and their mac potato salad...US$11 tax included. 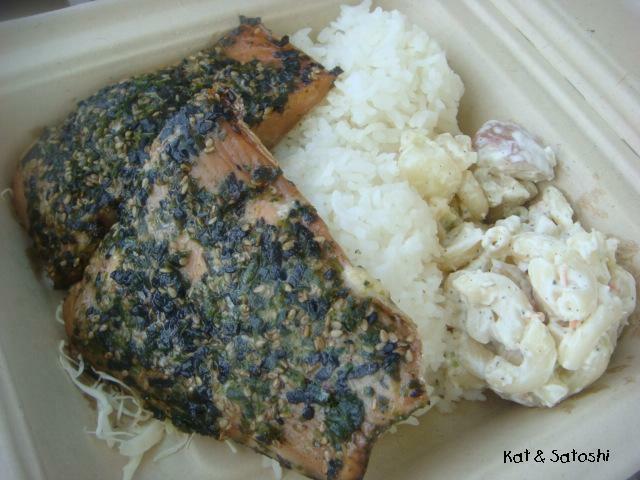 The salmon was very moist and flavorful but the mac potato salad a bit too salty for my liking. The pieces of salmon were very generously sized too. This truck does a lot of grilling, so most everything I think would be tasty. 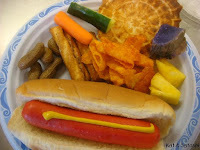 They even had a grilled vegetable medley which sounded delicious too. Oh and if you follow them on Twitter, you can see what their daily specials will be. 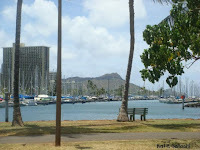 After picking up our lunch, we headed to Ala Moana Beach Park and found a bench under a tree to sit and enjoy our lunch. As we ate and chatted we noticed many Japanese tourists taking their wedding photos here and there. I was surprised that the park was unusually quiet. 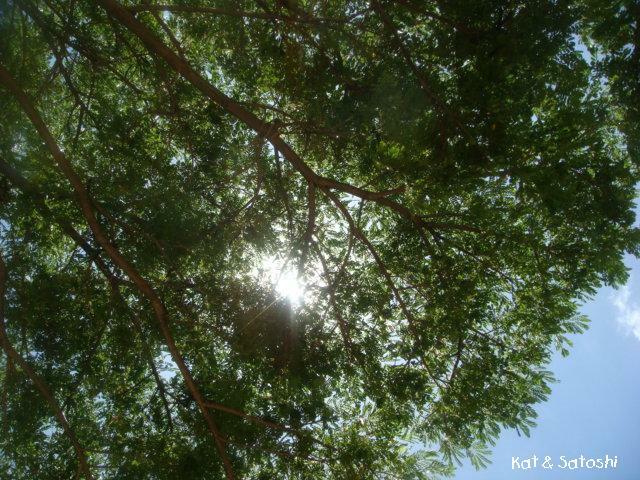 It was quite peaceful and relaxing. It was a great day, nice company and great food...thanks Deb! 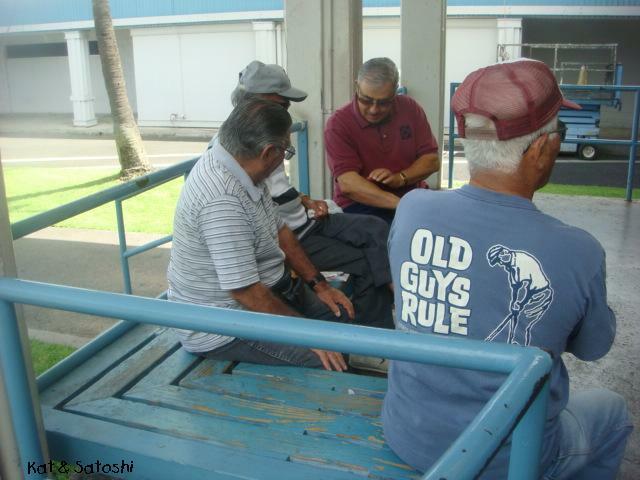 Most times in Hawaii, there isn't a dress code for men. You can go "out" in t-shirt and shorts. If the event is "fancy", then some dress in aloha wear or maybe a polo shirt. Suits or jackets are rarely worn here. A lot of our t-shirts have local sayings on the back or front. Some may be funny to locals but not necessarily so to "foreigners". 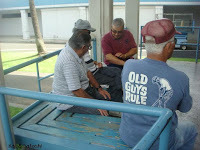 Anyway, I recently saw this group of grandpas outside of the market, chatting away and people watching. The other day someone re-tweeted that Let Them Eat Cupcakes were selling their maple bacon cupcake on Monday. 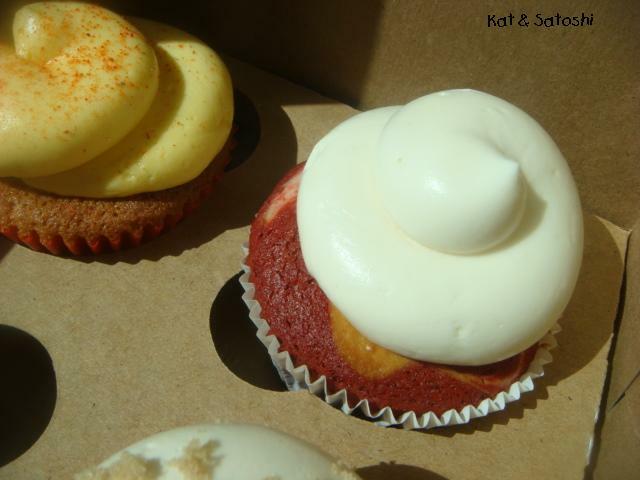 Let Them Eat Cupcakes was started by two employees of the Honolulu Advertiser who lost their job when the paper went out of business. So, I told my friend Wen because she had also mentioned that these cupcakes were intriguing. And since I had to meet a friend for lunch on Monday, I went a little early to check them out. I got to their shop at around 10-ish and it wasn't too busy. I purchased their Maple Bacon, Li Hing Mango and a Red Velvet Cupcake and shared them with my parents. 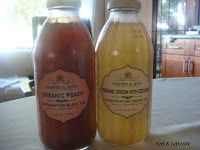 First off, I love their packaging! The cupcakes don't get damaged because they are in their own little "cubicle". 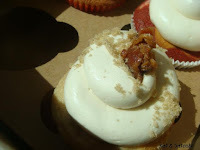 The bacon flavor was very prominent, maple flavor kind of light. I liked that there were actual bacon pieces here and there too. 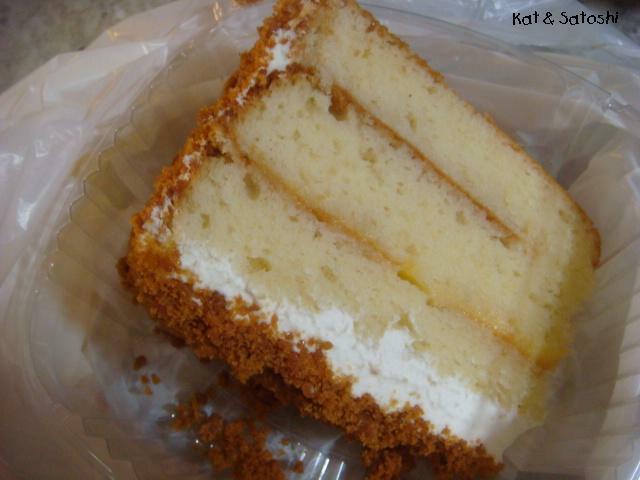 My parents felt the mango wasn't prominent enough, but I could taste it in their frosting. 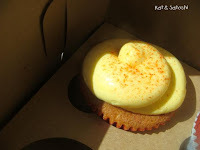 Li hing wasn't present at all though and I think the cupcake itself was vanilla....meh! The red velvet cupcake had cream cheese swirled in the dough and was tasty. 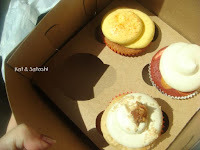 Overall, we liked these, but felt that eating 1 was enough for one sitting because the buttercream was the real deal and overall very rich. The Bikini Blonde Lager by Maui Brewing Company is fruity and light. We had this with chips, boiled peanuts, some spicy mango salsa and some cheddar cheese. Perfect for summer, my only peeve was that this beer didn't stay cold for very long, I think it was because it was in a can. I saw one on Hapa|Hale's blog earlier this year and wanted to get it. It is embossed with the Hawaiian Islands. 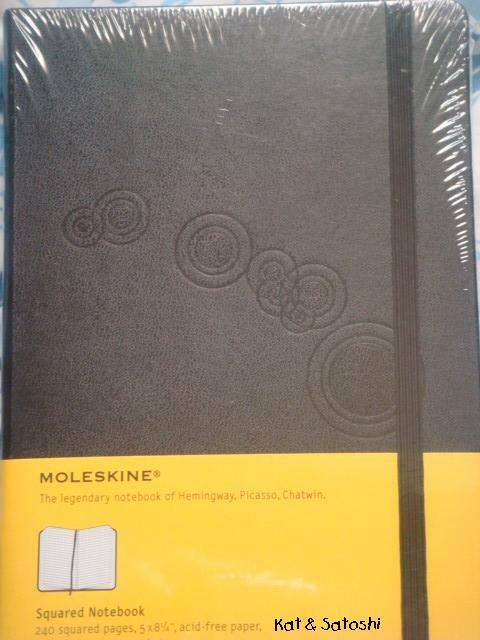 I've not yet used the grid-type of notebook, so I look forward to using it after I fill up my journal type notebook. I also have the free app they have on iTunes, but it is too complicated and not very useful in my opinion. There is also an address book in the daily diary, so I stuck a sticker of President Obama on it (for no particular reason)...I have addresses and phone numbers in it, though I am not using it alphabetically, and I also have notes and memos in there too. 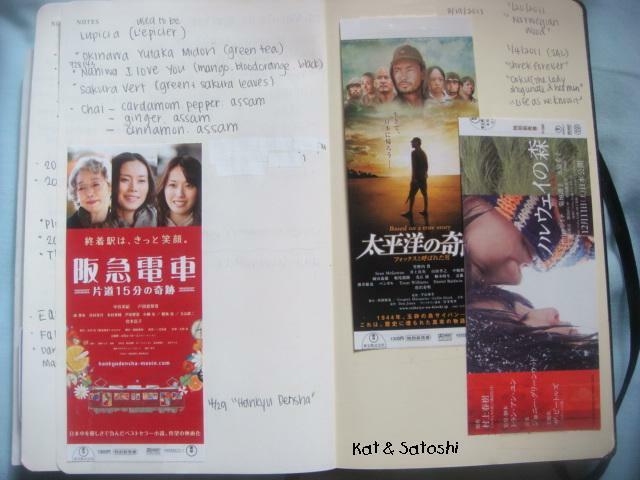 Whenever we go to the movies in Japan, pre-sale tickets are much cheaper than buying them on the day of the show (1300 yen (pre-sale) vs 1800 yen (day of) about US$13 vs US$18). The neat thing about this is that after they remove half of the ticket to exchange for a seat ticket, you are left with a mini movie poster, so I've started sticking them in my daily diary also. 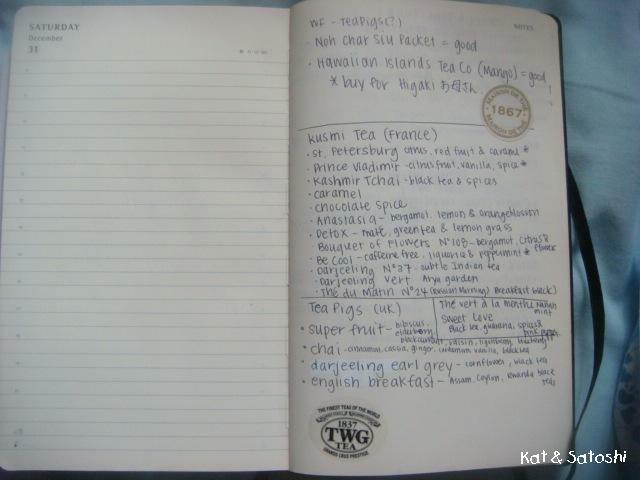 I've also started jotting down the different teas I've tried by various makers. 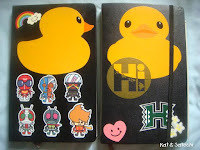 The only thing about these large notebooks is that they are quite heavy. 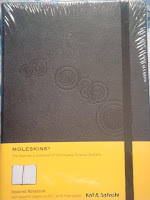 Do you use moleskine? What do you use them for? Do you like fried noodles? I do. I prefer them dry, not "wet" like some places serve them. In Hawaii, most places use saimin for their fried noodles. 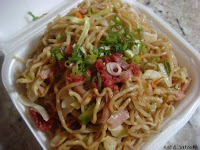 In Japan they are called yakisoba sometimes yakiudon depending on the type of noodles that are used. 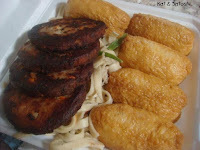 And there are "dry" & "wet" types of fried noodles here too. To me, the "wet" types are on the mushy side. One day, while I was surfing around, I came across a place in Waipahu that is supposed to serve "the best" fried saimin at Sato's Okazuya. I had never heard of this place before, but wanted to check them out. So after an errand in Waipahu, we picked up the small size to divide amongst my mom, dad and I for lunch...US$4 + tax. Their small was rather large because when they measure out the serving, they use a paper tray, no weighing, then just heap it on afterwards. The noodles are dry, chewy, almost al dente, there is a lot of flavor from the spam, char siu and other veggies that are in there too. While they do have other items on their menu (which we didn't order), I think this one is their star. Even if you come before the lunch crowd, be prepared to wait, they are constantly making new batches of fried saimin to keep up with the orders. Do I think they make the best? Maybe and I would definitely go back here to get some when the craving hits me. p.s. today is Umi no Hi (Ocean Day) in Japan, a national holiday, unfortunately, I hear there may be a typhoon approaching the Pacific coastlines of Okinawa & Japan, stay safe you guys! 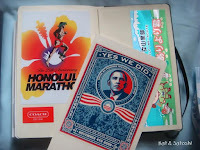 One thing good about having a blog is that you have a quick reference through your archives...We recently re-visited The Alley in Aiea and bought some items for lunch. 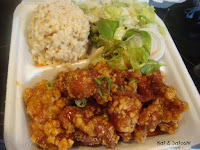 The Tasty Chicken plate...chicken fried crispy then coated with a sweet chili and garlic sauce...spicy and delicious. 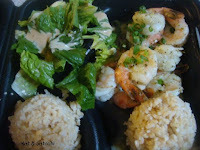 The Suppa (super) Garlic Shrimp...shrimp cooked in lots of butter and garlic! yum. It looks like a little but we actually received 9 pieces of shrimp. Dad said the chicken was "tastier" than the shrimp. And for dessert, a slice of their signature lemon crunch cake to share...the cake is very moist, and the outside coating is like a brittle...delicious! It was nice to re-connect with this place and to know that their quality hasn't faltered. Do you volunteer? I thought about it and realized that I have been doing so ever since grade school, from sign waving for politicians to cleaning the highways with organizations. Well, it is that time of year again when I go to help my mom's church make tsukemono. We again did 300 pounds of daikon (long white radish) and marinated them for takuan and kogen (two types of daikon pickles). You may notice that the hot dog is red, people in Hawaii love their "red" foods. These hot dogs don't have the "snap" that I've come to love but it was delicious all the same, a little nostalgic even. I also love the chatter during and after, so many personalities, some hard work and lots of fun. 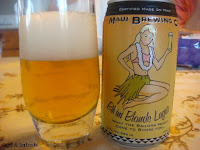 I am kind of leaning towards the time we stayed at the Lodge at Koele on the island of Lanai, when we got married in 2000. 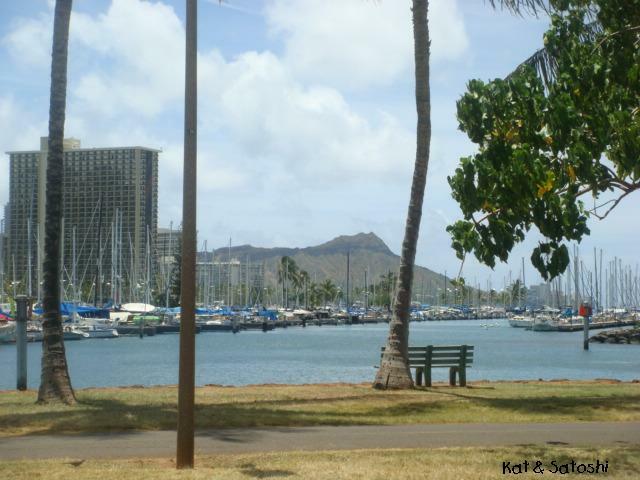 Usually whenever you have a wedding reception at a hotel in Hawaii, the hotel includes a room for you to stay in. Since we had our reception at a golf clubhouse, the clubhouse catering gave us a room at any hotel of our choice. 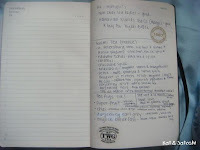 We chose the Lodge at Koele, so all we had to pay for was our airfare. The hotel had a daily afternoon tea held in their lobby area and guests could have various teas and sweets...one of them being scones. Recently my friend, Val, gave me a package of those scones from the Lodge...these are dense but are delicious after they are toasted a little. No need for butter or jam, the cranberries give them a lot of flavor. 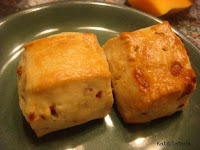 I'm glad I got to re-connect with these scones, thanks Val! Met up with my friends Val & Greg for lunch the other day. 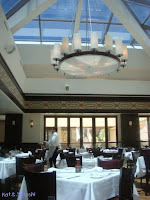 We went to check out Wolfgang's Steakhouse in the Royal Hawaiian Shopping Center. 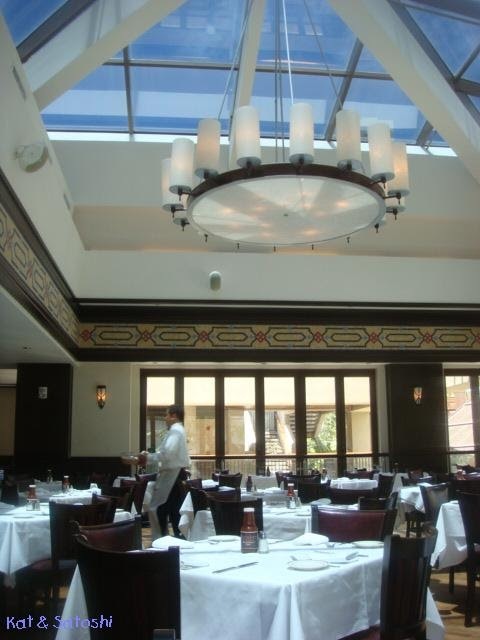 This restaurant is not Wolfgang Puck's, it is Wolfgang Zweiner's (apparently some people on Yelp thought it was Puck's and were disappointed when it wasn't)...anyway, they've been having this $10 lunch special ever since they opened up 2 years ago. For US$10 + tax and tip, you can choose a WG burger (1/3 pound burger with lettuce tomato, onion, steak fries & onion rings) or their mahi sandwich or a seafood salad. 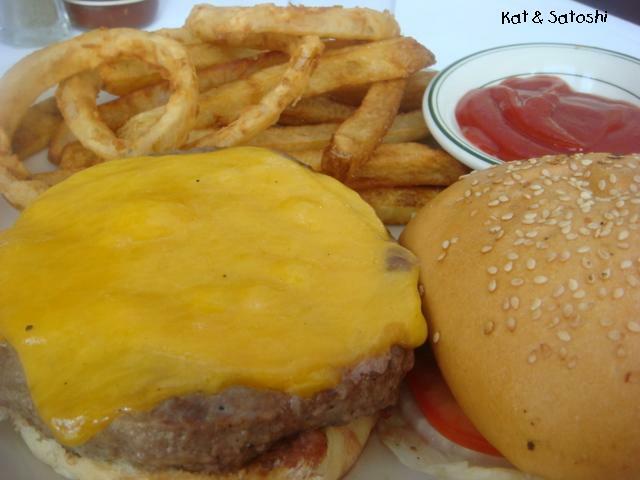 Well, I figured since we were going to a steakhouse, I should eat something steak-related, right??...hamburger. At first, Greg told me, that they told him, they offered 3 kinds of cheeses, one being Gruyere...it turns out that they only have one...cheddar...sigh! 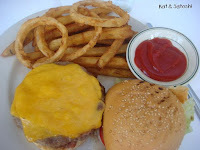 I ended up eating the innards, some of the fries and all of the rings and leaving the sliced onions and bun because all the juices from the burger made the bun really soggy, mushy even. 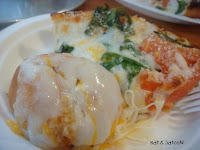 Oh and that slice of cheese...ended up costing me an extra US$2!!! I think I could've bought a whole package for that amount...now, if it were for bacon, I may not be ranting...ahem! Still, the burger was delicious, the company was good and the conversation never ending. Thanks for a great lunch Greg & Val!